Tomorrow before the open, Spotify (SPOT) will report their Q3 results. The options market is implying about a $15 move in either direction or about 10%, which is nearly double the average of about 5% the stock has moved the day following its first two earnings reports as a publicly traded company. 1) Paid Subscribers: Spotify guided to 85-88MM Paid Subscribers in Q3; we are estimating 86MM, slightly below Street at 87MM, implying 39% Y/Y growth. 2) Premium ARPU: We are forecasting a €4.69 Premium ARPU for Q3, implying 7% Y/Y decline, 5pts above Q2 at -12% Y/Y. 3) Gross Margin: SPOT guided to a 23.7-25.7% Gross Margin for Q3, and both RBC and the Street are forecasting a 25% GM. We note that the company also guided to a 23-25% Gross Margin for 2018 (RBC forecasts 25%). My Take: SPOT is clearly a unique digital property, but not exactly in the same vane as Netflix (NFLX) which has a fairly similar model. Despite NFLX spending billions of years on original content creation, the company has much higher gross margins at almost 40% vs SPOT at 25%, and higher revenue growth (35%) vs SPOT at 30%, despite being on a much higher revenue base $16 billion vs $6 billion. As Mark mentioned in his note, profitability and monthly active users will be the focus of investors, and a disappointment on either and investors will shoot first and ask questions later. A beat and raise has the stock up near the 10% implied move in my opinion, but much like NFLX two weeks ago, it might be met with selling as some investors who thought the stock’s sell-off from nearly $200 in the summer was getting overdone might look for any pop to get out as the mood has clearly changed a tad towards high valuation, high growth stocks like NFLX and SPOT. So what’s the trade? Options premiums are through the roof, as I said above the implied move, which is the at the money weekly straddle (the call premium + the put premium) is offered at about $15. So if you were inclined to make to make an at the money directional bet into the print by buying a put or a call it would cost you 5%, that is what you would risk and need to clear in two trading days. Regular readers know our view on long premium directional trades into events like earnings, specifically buying puts or calls outright, even with a lot of conviction, you need to get a lot of things right to merely break even, first and foremost direction, then the magnitude of the move and of course timing, as it is ticking against you. Rationale: this trade targets the 10% implied move over the next two trading days, get the direction wrong and the trade will be a total loser, but it is only risking 1.1% of the stock price, with about a 30% chance of break-even on Friday’s close and only an 18% chance of max profit at $165 on Friday’s close. So the odds are not great, but the premium at risk is not aggressive. while offering nearly a 5 to 1 potential payout. 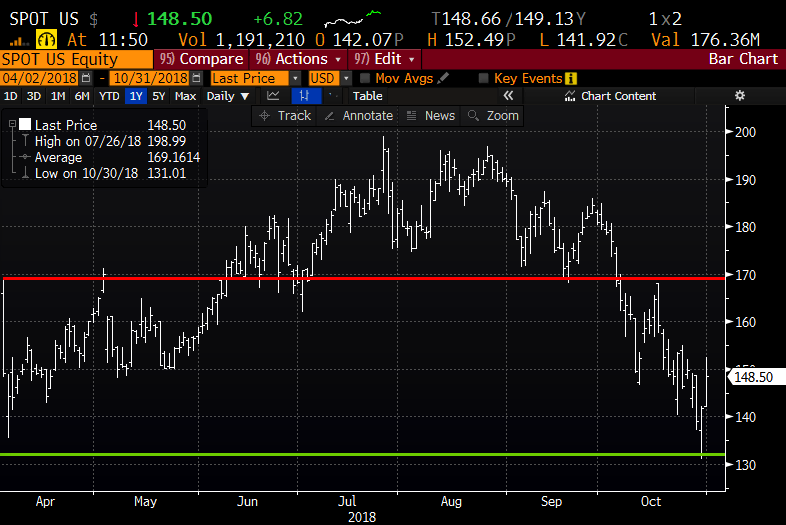 Rationale: like above, this trade targets an important level, in this case a spot where the stock might find some support in the coming days if it overshoots the implied move. This trade also offers about a 5 to 1 payout which is an attractive risk reward when chosing a butterfly.